John George Brown was a British citizen and an American painter born in Durham, England on November 11, 1831. His Passing Show (Paris, Salon, 1877) and Street Boys at Play (Paris Exhibition, 1900) are good examples of his popular talent. Brown's art is best characterized as British genre paintings adapted to American subjects. Essentially literary, Brown's paintings are executed with precise detail, but poor in color, and more popular with the general public than with connoisseurs. Brown was one of the most successful genre painters of the late 19th century. 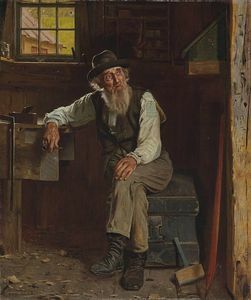 He worked as a glassblower in Brooklyn and proceeded to open a studio in 1860, launching his artistic career with a painting entitled "His First Cigar". His paintings of cheery street urchins, vendors and shoeshine boys were quite popular with wealthy collectors.